The Children of the Black Torrington Benefice have been helping to spread a little Christmas cheer by using their colouring skills and decorating a Christmas Card which has been delivered to over 900 homes in the Highampton, Bradford, Cookbury, Thornbury and Black Torrington areas. The winner of the 5 – 7 yrs was AJ Layton-House, Bradford Primary School, with his sister Madison Layton-House the runner up of the 8 to 11 years group. William Priest from Shebbear College was the winner of the 12 plus age group. The winner of the 8 to 11 age group was Ella Kurtz of Bradford Primary School, who was also the overall winner of the whole competition . 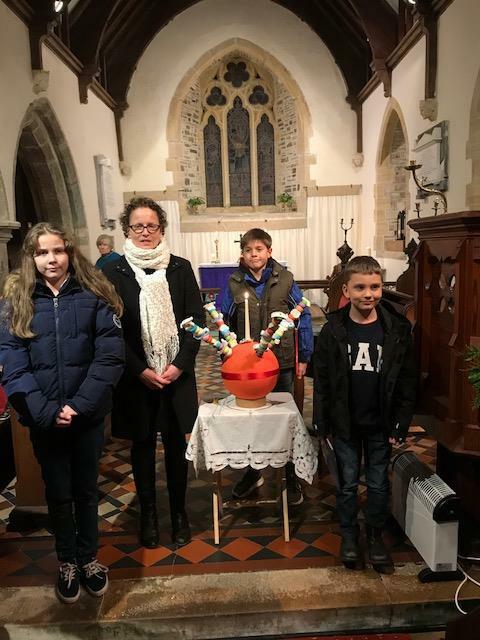 The children were presented with their prizes by Lisa Paton, Primary Lead for Bradford School, and the Presentation took place at St Peters Church, Thornbury during their Christingle Service.